Bankruptcy Basics: When Should You File? | Queens Bankruptcy Attorney - Bankruptcy Lawyer in Queens - Bruce Feinstein, Esq. 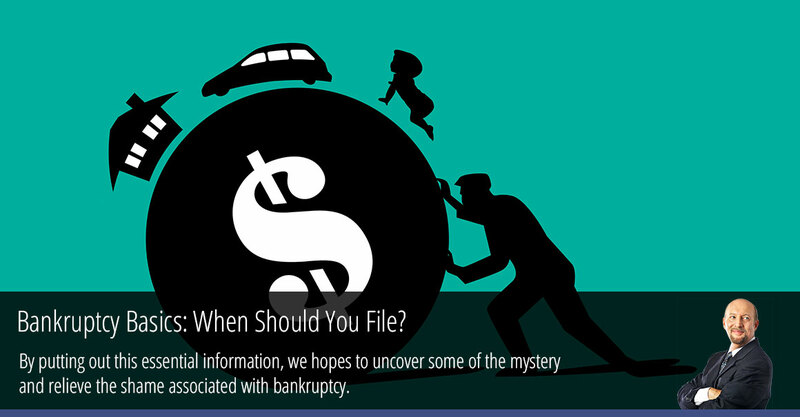 Bankruptcy Basic #1: Know When to File for Bankruptcy. We recommend asking a few questions about your financial situation before deciding whether it’s time to look into bankruptcy or a bankruptcy alternative. These questions include: Do you use credit cards to pay for your basic necessities? Can you only make minimum payment on your credit cards and nothing more? Are you unsure how much you really owe to debt collectors? If you answer “yes” to these questions, it can show you that it’s time to consider bankruptcy. Getting calls from bill collectors and eviction notices are common factors that can signal a need for bankruptcy, but taking a truly realistic look at your financial behavior is a good indicator of whether or not a client should file for bankruptcy in New York. Bankruptcy Basic #2: Know Your Financial Status. It is important to together a considered, detailed review of your current financial situation, no matter how much it scares you. So few people know exactly how much debt they owe to creditors, and exactly how much equity they have. Bankruptcy occurs when you owe more than you can pay, but you can’t honestly answer that question until you’ve reviewed all your accounts and options. Take stocks of all your liquid assets, such as cars, homes, retirement funds, savings accounts, and stocks. Next, tally up a list of all debts owed. These can be bank loans, credit card bills, medical bills, mortgages, and other loans. By comparing your debts to your assets, you can help show just how much money you owe, and the best way to pay it off. Bankruptcy Basic #3: Find the Best Type of Bankruptcy. Bankruptcy is not just one process you go through to get out of debt. There are various forms of bankruptcy in the U.S., each with its own set of rules and qualifying factors. At this point, it’s best to work with a bankruptcy attorney before you file for bankruptcy. This professional can help you find the best form of bankruptcy and take you through the proper steps, as well as act in your best interest in court. The two most common forms of bankruptcy are Chapter 7 and Chapter 13. Chapter 7 comprises liquidating assets to pay off your debt. Your assets are sold, and the money is distributed among your creditors according to a court-approved agreement. Once this is complete, you receive a notice of discharge that signals the end of the bankruptcy, and a record of the bankruptcy stays on your credit report for ten years. Having a bankruptcy on your credit report is not a death sentence, and a good bankruptcy attorney will show you how to build back credit. Chapter 13 bankruptcy, called a “reorganization bankruptcy,” allows you to pay back debts according to a repayment plan agreed upon by you, your creditors, and the Court. Any unpaid debts that remain at the end of this plan period are discharged, and your bankruptcy is finalized. This is a good option if you have consistent income and want to keep your assets, like your house or car. Filing for bankruptcy is a complex process, but following our tutorial will help you approach it with the right information. Pair this with strong legal representation, and you can get the fresh start you need. If you are considering filing bankruptcy in Queens, New York, Contact the Law Offices of Bruce Feinstein, Esq. today for a Free Consultation.